The first photos surfaced today of George Clooney in New York, recovering from his motorcycle crash. The actor’s arm and hands were bandaged up. Meanwhile, “Extra” got new video of George’s girlfriend on crutches this afternoon, as well as new details of their frightening accident. Jerry Zaslavsky and his wife not only saw Clooney crash his rented Harley Davidson, Clooney left the $18,000 bike with them before rushing off in an ambulance to receive treatment for his fractured rib and girlfriend Sarah Larson’s broken foot. Clooney reportedly met Sarah in June in Las Vegas. Meanwhile, the driver of the Mazda that collided with Clooney maintains it was not his fault. 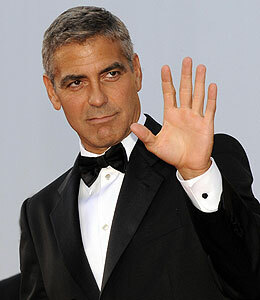 However, Clooney insists the car cut him off, although nobody has been charged. While the banged up actor and his girlfriend recover, even hitting the red carpet tonight for the premiere of "Michael Clayton,” the driver says no hard feelings. “I'm definitely a George Clooney fan,” he insisted.